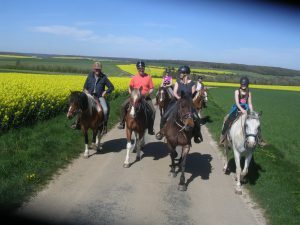 We offer rides between three to four hours on our horses and ponies. All rides are guided by a certified horseback hiking guide. Several wood paths and riding paths offer great possibilities to ride in the wonderful landscape of the Burgundy. From our farm you can start interesting rides to the picturesque villages and forests of the surrounding. We are located in the French long-distance walking trail GR 7. Apart from that there are lots of great riding paths in all cardinal directions. For sure you will ride through the old city gate in the close village Grancey-le-Château, to the spring of the Tille, to the castle in Courlon or into the bog in the national park of Chalmessin. After a refreshing shower you can enjoy a good dinner before letting the day fade away in front of the fireplace. You live and ride in a quiet idyll embedded in fields, meadows and forests. A paradise for all who are looking for nature, tranquillity and recovery. Our youngest guests (from three years on) can make their own riding experiences on our reliable Shetland Ponies. These are being lead by the parents and can be rented for 30 or 60 minutes. Our horses live on the farm all year long on our vast meadows. They only stay in spacious pens when the weather is not good enough. Selle Français, Shagya-Arabian und Appaloosa-cross breeds are the base of our riding business. They are reliable, sure of step and suitable for every riding level – from beginner to advanced riders. They can be ridden in English or Western style. Our horses are guided by simple body language principles which supports the mutual respect between human and horse. Due to the species, appropriate keeping and training the horses are very relaxed and human orientated. Of course your own horses are welcome as well. We offer different keeping possibilities in stalls, pens or on our meadows and would like to talk to you about our offers. 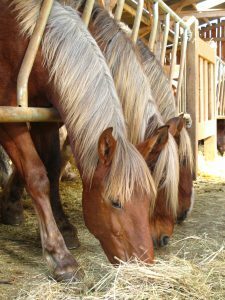 But also family members or friends that do not ride will have a great time at Ferme de Borgirault. Apart from our horses and ponies we offer especially children an interesting and close insight in farm life. Please contact us and we would be happy to plan your next riding holiday in France with you.